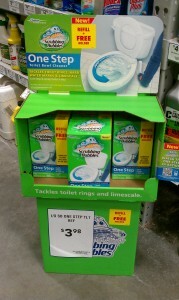 $0.98 for Scrubbing Bubbles One Step Toilet Cleaner w/ Coupon! $9.97 Value! If you've been having trouble finding Scrubbing Bubbles One Step Kits at your Walmart, you should try Lowe's...they're on sale right now for $3.98, allowing you to get one for just $0.97. These regularly cost $9.97! NOTE: Your Lowe's may or may not have the same sale right now, but it's worth a shot checking out! Thanks, Become a Coupon Queen for the deal and photo!